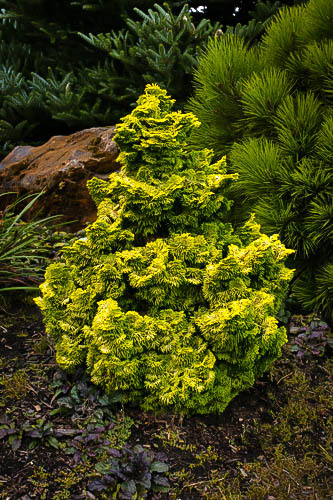 The Dwarf Golden Cypress is a glowing cone of rounded and coral-like evergreen foliage in a striking golden yellow color. It forms a broad conical shape around 6 feet in height and 4 feet across, growing somewhat taller and broader in its final maturity. 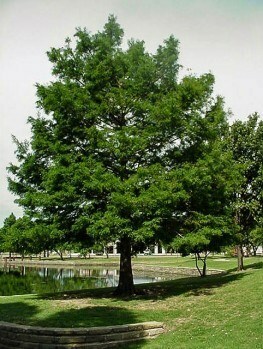 It makes the perfect accent tree in a bed, or an ideal part of the foundation planting around your home. It is hardy to minus 30, but thrives in all but the hottest areas. It will grow in most soils, as long as they are not constantly dry, and loves a sunny location, which will bring out the strongest yellow colors. It has no pests or diseases and needs no special care to become a special part of your garden, with its unique clustered foliage. This plant belongs in every garden; because few other plants bring bright color to every season, including the dark days of winter, and few plants need so little attention to do that for you. 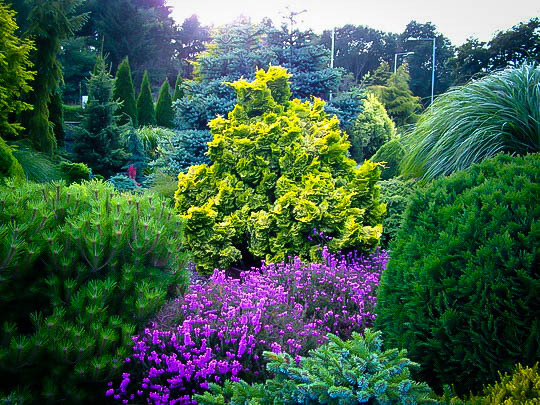 Evergreens like this give a structural permanence to your garden which is a vital part of all the best gardens, and the Dwarf Golden False Cypress adds a powerful color-accent too, so it is a ‘must have’ wherever you are. 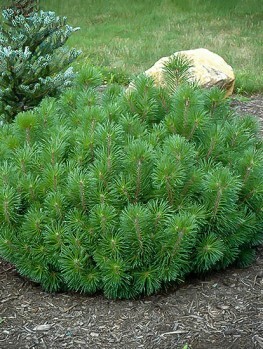 Dwarf evergreens are wonderful garden plants. Not only are they with us all year round, staying fresh and green through the gloom of winter, but they are all so different, each with unique qualities that make them worthy of a place in any garden. Some, however, really stand out as ‘must haves’ because they bring light and brightness to the gloom and hold their color no matter what the season. The Dwarf Golden False Cypress is just such a tree. 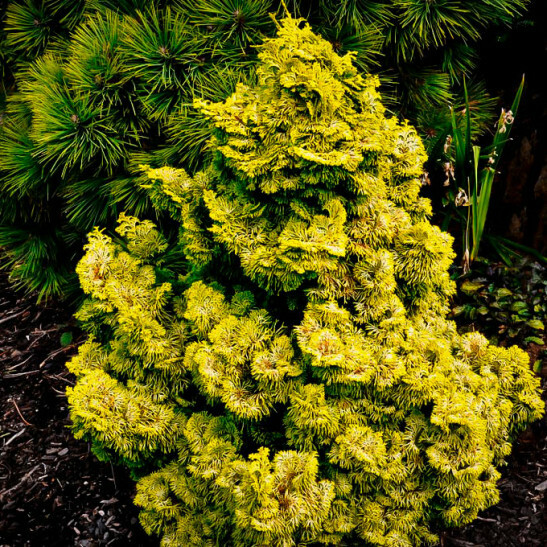 Unlike some other golden evergreens, this is one that stays golden through all the seasons, just as long as it is in the sun. So even in the depths of winter it makes a glowing beacon in the gloom and lightens the garden like nothing else can. A special plant like this can never be grown from seed, so we have our specialist growers take selected pieces from verified parent plants to begin the slow process of producing new plants. For that reason, you should always avoid cheaper seed-grown trees, as they certainly won’t be this plant, or anything like it. As a strong part of the basic planting of any garden the Dwarf Golden False Cypress takes some beating, so don’t hesitate to choose it. We regularly receive new stock, but quality plants like this are always in high demand, so order now to avoid disappointment. 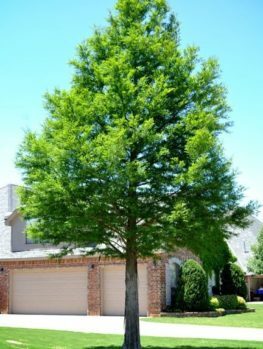 The Dwarf Golden False Cypress grows at a moderate pace and will reach 6 feet, eventually growing even taller, and spreading into a wider conical shape with age. You will only need a little patience to see that mature specimen, since this is an easy shrub to grow, just plant it, water it regularly while young and then let it go. It has no significant pests or diseases and always looks fresh and bright. It easily survives winter temperatures down to minus 30 and will grow everywhere except Florida, southern Texas and California, so it can be used right across most of the country. 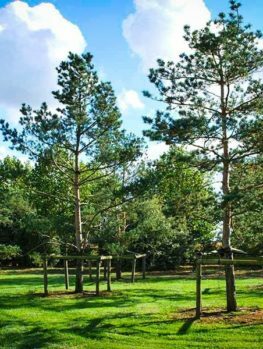 It is also not particular about soil, as long as it is well-drained, but it does benefit from richer soil, so add plenty of organic material to the planting hole and mulch every spring with a good layer of rich organic material too. You will really see the benefits. Choose a bright sunny spot for the maximum yellow color, although in the hottest areas a little afternoon shade may be beneficial. 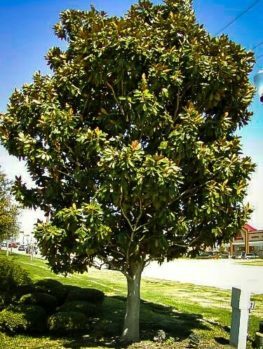 Even in partial shade this plant has an attractive and eye-catching lime-green color, so even if you do not have sun all day in the spot you are planting in, this tree is still a great choice, considering all its other good features. If you want really dense growth a light shearing in late winter, before the new growth begins will do that, but don’t over trim this tree or the unique coral form of the foliage clusters will be lost. It is not only the color that makes the Dwarf Golden False Cypress stand out in the garden, but the foliage itself is eye-catching and different. The branches spread out into overlapping sprays of colorful soft branches, each cluster rounded and cupped, so that the effect is like clusters of shells, or perhaps even more like certain kinds of corals. This gives a very rounded and full appearance to the bush, and since the foliage persists to the ground for decades, this is one plant that will never look bare or thin. 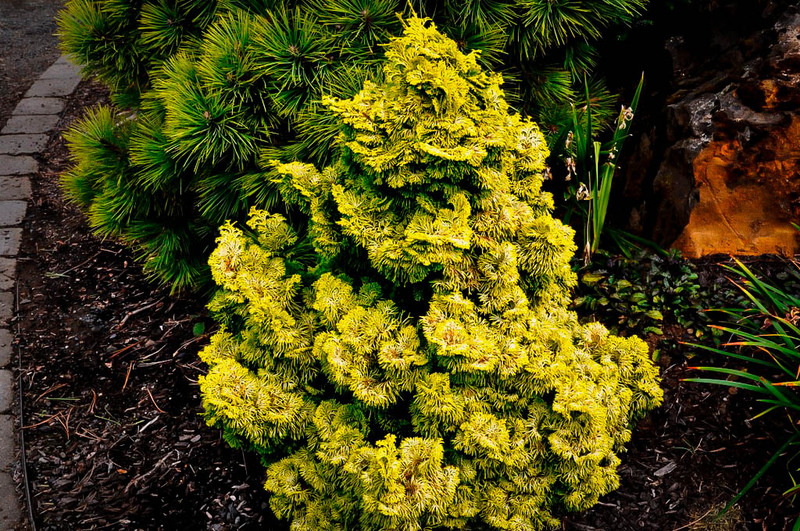 In color each spray is a rich golden yellow and this plant is widely considered to be one of the most reliable golden dwarf evergreens available. This plant is ideal for foundation planting around your home or as a specimen in a bed of other small shrubs and plants. Around the house it will fit below windows or in the corners of the building, as well as looking lovely framing a door or entrance. Its natural dense and dwarf habit means it never needs shearing, so it’s low maintenance too. It can also be used in a courtyard, planter boxes or large pots and will add good vertical interest as it matures. The wild False Cypress Tree (Chamaecyparis obtusa) grows in Japan. 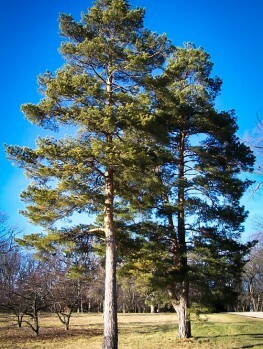 It is a large forest evergreen, growing over 100 feet tall and looks somewhat like our native white cedar. It is a source of high-quality lumber. 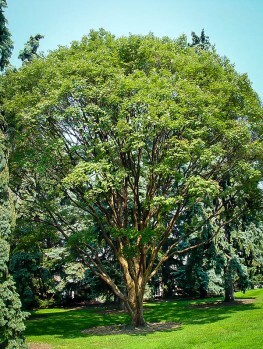 Because of its size, it is rarely seen in any but the largest gardens in its native form, but a large number of smaller forms have been collected over the years by enthusiasts. 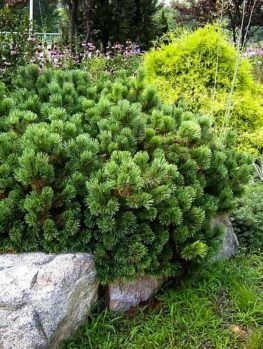 The Dwarf Golden False Cypress was found in 1966 by Jan Spek, a keen professional gardener and founder of Jan Spek Rosen, Boskoop, in the Netherlands. Always keen to widen the range of plants available he sent it to other nurseries and it quickly became a big hit.